Now that you have an understanding on how CNC woodworking machines work. Lets take a look at the different types of CNC routers and the different features that are available. Industrial CNC routers is a rather general category. 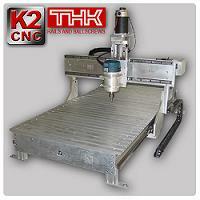 Industrial CNC routers make up roughly 80% of the CNC routers in circulation. Many woodworking companies own several of these machines to produce the bulk of their products such as furniture, doors, signs etc. Some of the leading companies offering these machines are MultiCam and Techno Inc. These machines are not limited to CNC woodworking. They can be used on a variety of materials depending on the specifications. If you are interested in buying a CNC router, I suggest you check out the Buyers guide. The next step down from an industrial CNC router would be a midrange CNC router. The precision and accuracy of these machines are not necessarily less than that of an industrial type. They often use the same internal components. However, these machines are usually much smaller and lighter than their big brother counterparts. 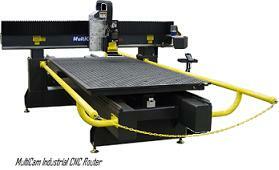 Mid range CNC routers usually run from desktop CNC router size to a full 4 foot by 8 foot layout. These machines are popular with hobbyist and smaller businesses with less production. Many small guitar manufacturers and sign makers use these machines. They are also in the price range of some hobbyists which use them for their personal projects. These machines are usually less of a full package and do not come standard with dust collection systems and vacuum tables etc. However, there are some companies who offer these as add-ons. Hobby CNC routers are usually referring to the homemade CNC router. These machines are usually designed and built by the owner. There are many plans that may be bought or downloaded. These designs are as unique as the person designing or building them. Each machine is different and is usually designed around the parts and budget available. There are many homemade CNC woodworking routers out there that rival the industrial ones. If you are interested in building your own you can find plans and a builders guide here. Within these three categories you can find a host of specially designed CNC routers. All CNC routers have 3 axes and may cut in 3 dimensions. However, some applications may require more flexibility. This is where four and five axis CNC woodworking routers four and five axis CNC woodworking routers come into play. A 4 axis CNC router usually means that either the spindle head may rotate in one additional plane or that a turn table of sorts is attached to the cutting bed. A 5 axis CNC router means that the spindle can rotate in 2 additional planes. You can see this well in the picture to the left. 4 and 5 axis CNC routers offer the ability to cut a true 3D part. A traditional 3 axis machine is limited as to the depth in certain dimensions. These machines are popular with rapid prototyping and artistic industries. Be expected to pay a hefty price for these additions. They require special controllers and software and are more difficult to learn. There are also many specialty type CNC routers such as engraving machines and 3D engraving machines, PCB routers, CNC routers made to carve granite, and more. CNC engraving is very popular. These machines do everything from plaques and tags to trophies. These machines are much smaller and usually have a working area of 12 by 12 inches. However, they operate on the same principles as a CNC router. The CNC PCB router is also small and is designed to create circuit boards. If you love electronics then this machine gives you the ability to create professional circuit boards in a matter of minuets without having to deal with messy etching equipment. As you can see there are a variety of CNC woodworking machines available and even though they are classified as such, they are not limited to woodworking. There are all types of CNC machines, one to fit almost any need. You also have the option of designing and building your own which may be your best solution as CNC woodworking machines can be costly. Now that we know about the different types of CNC woodworking machines available, lets take a look at some prices.